MyNokiaBlog.com one of the “tech blogs” that Nokia Conversations readers visit! At the very end, the article talks about other sites you visit for Tech/Nokia news other than Nokia Conversations. 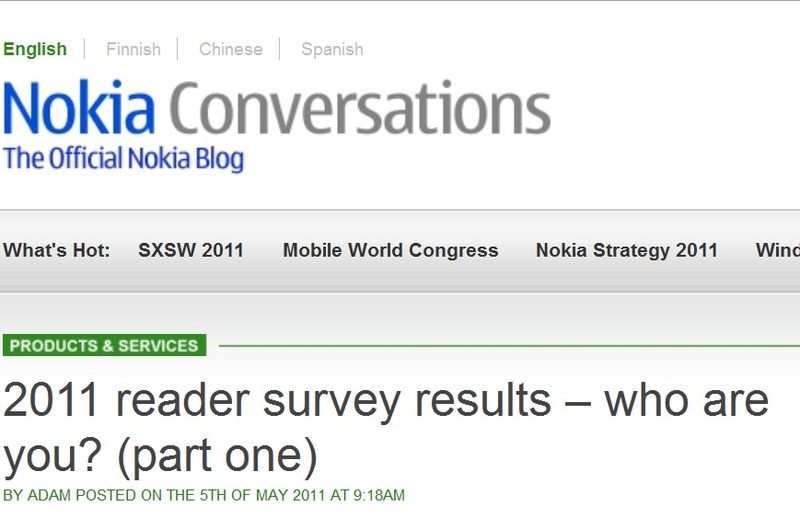 We know you all enjoy a good read here on Nokia Conversations, but why do you visit our site and where else do you go? A quarter of you log on here to keep up with company news, and another quarter are just general technology fans looking for a mobile-tech-fix. When you’re not here, many of you are reading articles at Engadget, with AllAboutSymbian and GSMarena following closely on its tail. My Nokia Blog is also a favourite. As probably skewed by the type of people who fill in surveys and the fact we post about Nokia Conversations stories, that might be the reason for the cross over of readers on our end. Nevertheless, I think it’s awesome that MyNokiaBlog.com is included amongst the likes of Engadget, GSM Arena and All About Symbian. Thank you to our readers who filled in the survey over at Nokia Conversations and mentioning us as one of those places you come to visit for Tech/Nokia news.